1979 Topps Star Trek: The Motion Picture trading cards capture the franchise's first big screen adventure with a set that's filled with classic characters and a whole bunch of strange aliens that would give any frat house Halloween party a run for its money. The product has a total of 88 cards and 22 stickers. The base set is a mix of shots from the film as well as publicity stills. The Bridge Crew, back and looking a little bit older than when they were last seen on the show a decade earlier, make up a good chunk of the checklist. However, there are also sizable chunks dedicated to near characters and spaceships. It's these posed cards that give the set a lot of its flavor. Card fronts take a bit of a different approach over other sets from the era. Borders are white. Images have a solid-colored frame with an icon of the U.S.S. Enterprise soaring along the bottom. Rather than a large caption along the bottom, which is traditional with a lot of set, it's done with much smaller font along the top corner of the frame. Backs are a mix of puzzle pieces and write-ups. Text features actor bios, story summaries, character descriptions and quotes. 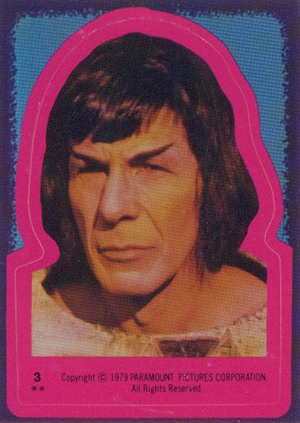 Every pack of 1979 Topps Star Trek: The Motion Picture has one sticker. These have two different designs, both of which are done with purple borders. The first is a very tradition Topps sticker look. Character portraits are die-cut and given a thick outline. The second design sets the image inside a shape that looks like an overhead look of the Enterprise. 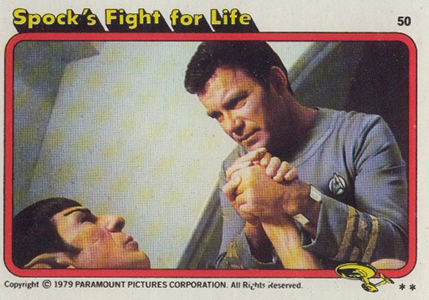 Even today, there's no shortage of supply for 1979 Topps Star Trek: The Motion Picture trading cards. Boxes, packs and full sets are all readily available. As a result, prices have been kept in check, especially considering their age. 88 cards. Shop for base sets on eBay. 66 "Beam Me Down Scotty"
22 cards. Inserted 1 per pack. I have 12 unopened packs of the 79 topps Star Trek cards I got looking for basketball cards. They came in the fun pack with Empire Strikes Back cards (I have 7 packs). How would I sell them? Should I open them or put them up unopened? Hi.. I have the entire collection of skybox star trek trading cards and some 1979 motion pictures sticker cards also the comic books I have everything from 79 to 2000 all mint condition and plastic where would I be able to see then or are they even have value to them. They ate in mint like new condition. 1979 Topps Star Trek Full Wax Box 36 Unopened Packs BBCE Sealed Tough!